“Light shines in the darkness for the godly. The Glory of Jesus lies in this: in weakness, vulnerability, and apparent failure. He has called forth disciples to come after Him, willing and able to carry the cross and relive His passion with compassion. They are marginal people, not part of the scene, irrelevant to the “action.” In their ministry or quiet presence they do not need to win or compete. They may even look like losers, even if its just to themselves. The world ignores them. But they are building “the Kingdom of God” on earth by reaching out in vulnerability and weakness to share the suffering of their brothers. They work by love rather than continue in sin. 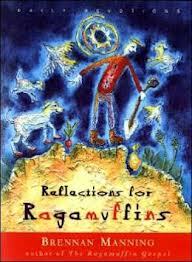 Brennan Manning, “Reflections for Ragamuffins.” From an entry dated June 27th. From “A Stranger to Self Hatred,” by Brennan Manning. Copyright @ 1982 by Brennan Manning, reprinted by permission of Dimension Books, Inc.
Pastor Bryan writes another winner….